MyTriniGrocery Hot & Spicy Duck/Goat Curry Powder :: Enjoy Hot & Spicy Duck/Goat Curry Powder! When it comes to curry, Trini's know how to get down! Almost anywhere on the twin isle you will find people cooking curry. Trinidadians curry a variety of foods from meat to vegetables to fruit. A curry is basically a mixture of ground spices that varies according to region and by personal taste. It may seem obvious but a good Trini curry quite simply consist of a Trinidad blend of curry powder. Curry Duck has become one of the most popular meats to curry and enjoy. 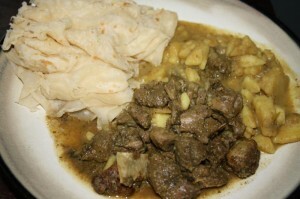 You will find many people cooking curry duck to enjoy with some hot roti, preferrably buss-up shut. This hot and spicy curry is especially blended for cooking your curried duck and curried goat. It brings out the richest flavours in your meat, for a tasty treat the whole family will enjoy. Best Trini Curry Out There! The label may say "Duck and Goat", but this curry blend works beautifully for seasoning chicken, beef, shrimp and veggies as well. Just the right amount of spice and flavor! Click the button below to add the Hot & Spicy Duck/Goat Curry Buy 2 Get 1 Free to your wish list.